Coffee w/ Chris: The growing problem of attorney suicide. In today's episode, I'm going to give you a quick introduction to the case of Cook v. Wilkie, a November 2018 precedential decision from the U.S. Court of Appeals for the Federal Circuit. This case is big: it involves when and how the BVA must provide a hearing when requested by a veteran. After watching this short overview, you can read a more in-depth discussion of the Federal Circuit's precedent in Cook by clicking here. We will talk briefly about the value of annual planning at a small or solo law firm, and then move on to the primary topic. The primary topic in this episode of "Coffee w/Chris" is something very important, but something not talked much about: the problem of attorney suicide. Attorney suicide is an increasingly prevalent problem in the legal profession. When it comes to suicide rates in particular professions, attorneys are in the Top 5. We rank up there with doctors, dentists and police officers as the most likely professionals to commit suicide. Attorney suicide is a big problem in the legal community, and we don't talk about the causes - or how to prevent - attorney suicide. 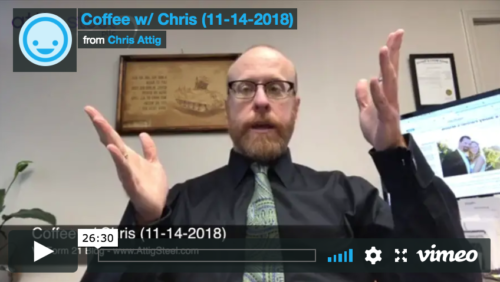 In this episode of "Coffee w/Chris," I am going to tell you about attorney Gabe MacConaill, a 42 year old partner at Sidley-Austin in Los Angeles who recently took his own life. You can click here to read his wife's storyo - she outlines the warning signs that signal whether other attorneys like you or I might need help, or that might tip us off that one of our colleagues might need help. I'll talk to you about a couple little changes you can make to greatly increase the likelihood that you - or one of your colleagues - will not become the next statistic for attorney suicide.